Sydney is an interesting city, and Justine knows that. It’s why she founded I’m Free Tours. She wanted to show everyone what her hometown had to offer. Justine is a sydneysider who noticed that walking tours of her city were too expensive for most people to afford. So she fixed the problem. Almost seven years ago she began offering free tours to anyone who wanted to learn about Sydney. At the end of the tour, she asks that participants pay whatever they think the tour was worth. Business is booming. Today Justine, along with a team of other guides, give walking tours of the city every day at 10:30AM and 2:00PM. She also offers a tour of The Rocks, Sydney’s oldest neighborhood, every evening at 6:00PM. As we had never been to the city before, we decided this would be a great way to get our bearings. We were correct. The tour begins at Town Hall in Sydney. There is no need to book in advance. Just show up and join the rest of the crowd that will already be gathered. The crowd gets divided evenly between four or five guides, and they’re off. It’s a three and a half hour walking tour that weaves through the city as only an insider could. If that seems a bit long, no worries, there is a break in the middle to catch your breath and maybe snag a bite to eat. Unlike some tours that only talk about the history and major landmarks of the city, I’m Free Tours also gives insight into bars and restaurants worth hitting up. Our guide pointed out secret and hidden bars and gave us tips for getting into fancy bars with stunning views. Also, because they don’t receive any kickbacks from sights or organizations, they will tell you honestly which sights are worth visiting and which are not. One of our favorite things about the tours, though, is that they give you the best free map of Sydney. As a bit of a brochure-a-holic, I had already picked up several maps of Sydney before we took the tour. The map they provided on the tour, though, became our go to map of the city. It is easy to read, and lists several points of interest without feeling cluttered. 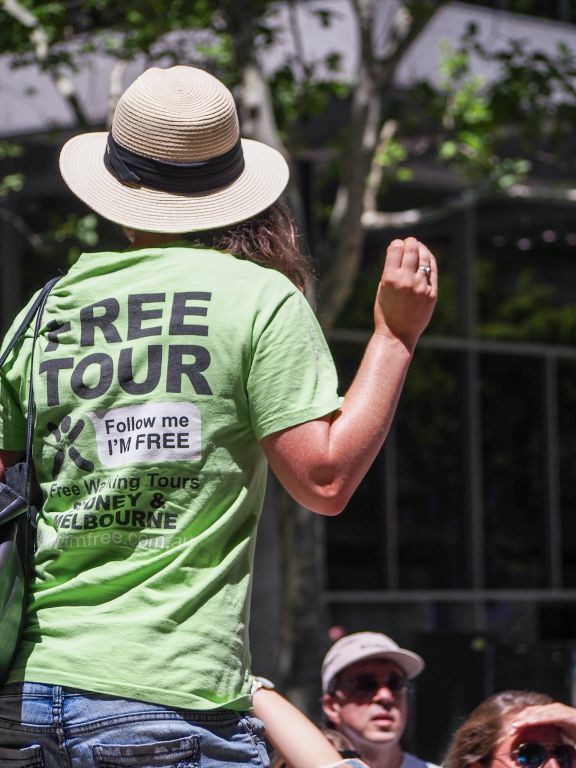 So next time you are in Sydney we definitely suggest tagging along on one of the free tours. It is a great way to get your bearings, learn some history, and find some great places to eat. Plus it fits any budget! What’s the story behind the dog and pig statues? The dog was Queen Victoria’s favorite dog. The statue was originally in Ireland, but they didn’t want it anymore so it went to Australia. Australia had one of their popular radio personalities record a message that plays when you stand in front of it so now it has an Australian accent.